YANGON — Four artists whose depictions range from the stunning islands of the Mergui Archipelago in Myanmar’s far south to Yangon’s bustling cityscapes will showcase their work in early September. The exhibition titled “The First Artist in Residence Exhibition of the Art Garden,” will be held at Bo Aung Kyaw Street Gallery in Yangon from September 1-7 and feature the paintings of Nyi Aung Maw, Saw Satay Pha, Min Zaw Aung and Zaw Zaw Ko. 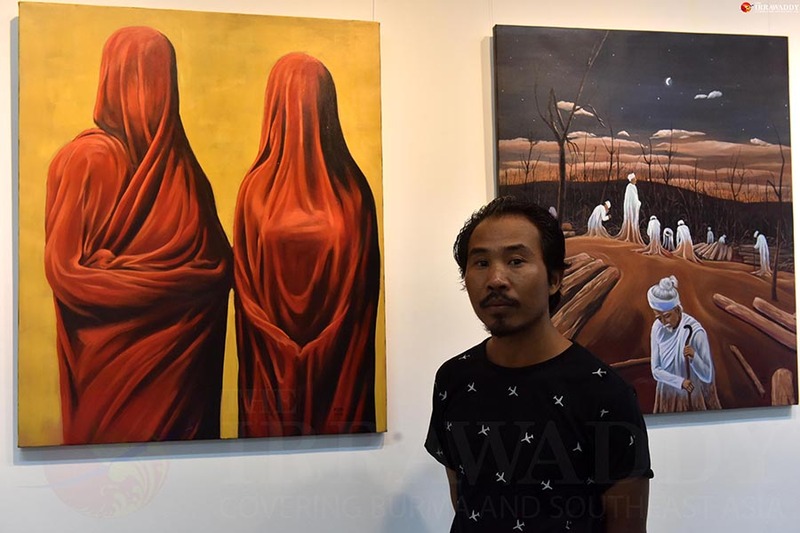 Min Zaw Aung is showcasing eight surrealistic paintings portraying love, vanity and mystery. One of the paintings show two people covered in red robes. At first glance, they seem to be monks, but on closer inspection their faces are covered and one appears to be a woman. “Wearing a cloak, the hollowness [in the painting] has become a tangible thing. I just don’t want to create and tell people what they are. 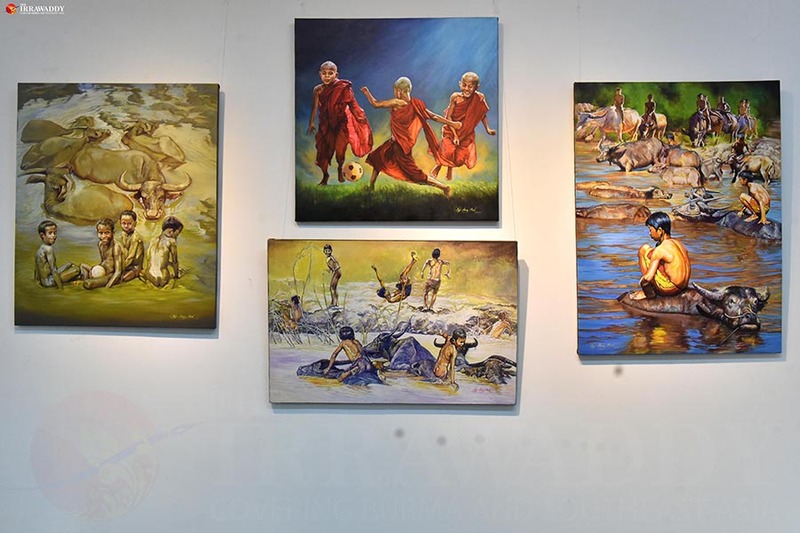 I prefer to leave my paintings to the imagination of the audience,” said Min Zaw Aung. The works of Nyi Aung Maw, a cartoonist-turned-painter, are full of fun. His paintings are all about children in rural villages swimming and playing in mud while herding buffalos, and novices playing football—just more than enough to evoke one’s carefree childhood memories. 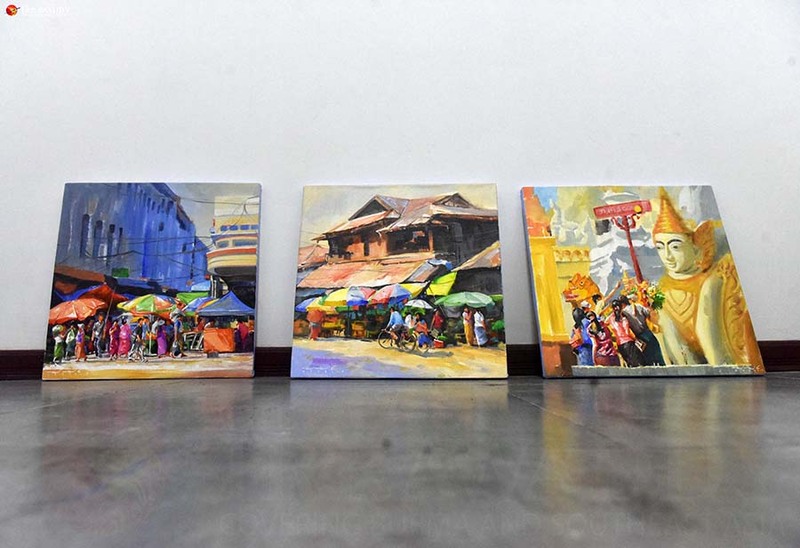 Zaw Ko Ko said his paintings are inspired by the life of people on Yangon’s streets, and in its markets and pagodas. Another artist, Saw Sate Pha, traveled deep into the Mergui Archipelago to take pictures of the landscape and people there. One of his paintings features the floating homes of Moken people—structures similar to houses in Shan State’s Inle Lake. The exhibition will display 40 acrylic paintings priced between US$250-$700. The four artists lived together at the Art Garden/Bamboo School in Yangon’s Kyauktan Township for three months to create their paintings. “Previously, other people arranged my exhibitions for me. This is the first time I’ve organized an exhibition as well as accommodation for the artists. So, I am delighted,” said Khin Zaw Latt, the founder of the Art Garden/Bamboo School and curator of the exhibition.